Red de Gestores Virtuales de Memoria  (Virtual Managers of Memory Network). Picture used with permission. In recent years, building a historical memory that is both pluralistic and inclusive has become one of the main strategies for bringing the long armed conflict  in Colombia to a close. Peace building endeavors have tried to promote a new narrative of the conflict that brings the victims of war to the foreground, makes visible their stories, dignifies them, and emphasizes their rights. One of these efforts is the Alfabetizaciones Digitales  initiative, from the Centro Nacional de Memoria Historica (National Center of Historical Memory), which has supported local grassroots organizations across the country in the use of digital media tools for storytelling and online publishing. Examples of the digital media texts that victims of the armed conflict have been creating and publishing on the Internet with the support of the Alfabetizaciones Digitales initiative include interviews with “alabaoras” (Afro-Colombian women singers) from Pogue , Chocó, who explain the significance of “alabaos” or funeral songs; short essays written by women from Caquetá  narrating their stories of displacement; photographs from a community museum  created by the survivors of a massacre in Granada  and hip hop music videos from youth advocating for participation and children rights in Buenaventura. I think the website and the content we publish on the Internet make memory. We have made memory with our videos and stories. The half-century long Colombian civil war is one of the world's oldest, and a commonly-cited estimate puts the death toll at almost a quarter of a million people. Millions more have been displaced by the conflict that bitted the government and right wing paramilitaries against the Revolutionary Armed Forces of Colombia (FARC). A peace deal reached and endorsed by congress in December has raised hopes of a new future for the country but many fear difficulties during the implementation. Since the 2000s, and parallel to the negotiations with guerillas and paramilitaries, the Colombian government has actively promoted building “historical memory” while trying to give a voice to the victims of war. This is part of a larger effort to implement justice, encourage reconciliation, and create a national dialogue on the rights to truth. In this particular context, the work of local grassroots organizations that support victims through cultural and community activities has become more relevant. For several years, these organizations have helped minorities and marginalized populations affected by violence to be resilient, build community, and articulate their voices. According to Mariana Posada Moreno, for instance, the Salón del Nunca Más  (The Hall of Never Again) project led since 2008 by Asociación de Víctimas Unidad de Granada (ASOVIDA), has helped the community in Granada, Antioquia, to find hope and unite. The purpose of this place is to raise awareness and show to anyone who arrives there, by means of art works, photographs, personal logs, and stories, that the victims of this country are not just a number for the State. The creation of the Colombian Law of Justice and Peace in 2005 and the Law of Victims and Land Restitution in 2011 directly addressed the need for placing the victims rights and their narratives at the center of the peace-building process, and emphasized the state's duty of remembering the violations committed during the armed conflict. Besides recognizing victims’ rights and emphasizing the need for reparations, the Law of Victims and Land Restitution created the National Center of Historical Memory , an independent institution in charge of building a historical account of the conflict. The National Center of Historical Memory has since become key in promoting the construction of historical memory in Colombia through research and applied activities that help to reconstruct the long and convoluted history of the armed conflict. The Center has created several publications based on thousands of victim testimonies and analyses of the war’s origins, including “¡Basta ya! Colombia: Memorias de guerra y dignidad (2013)” (Enough Already! Colombia: Memories of War and Dignity), the most comprehensive report on the state of the war in Colombia to the day. By actively supporting participation by the victimized population in the peace process and on the construction of a plural and inclusive historical memory, the National Center of Historical Memory has contributed to dignifying and making visible the experiences of the victims of war, and supporting the right to truth, justice, and security from repetition in practice. Alfabetizaciones Digitales  (Digital Alphabetization) is one of the initiatives that emerged from the Center in 2013, which has helped local community organizations to amplify their voice by using digital tools and networks. Alfabetizaciones Digitales  was created in response to the need of highlighting the work that grassroots organizations were already performing across Colombian territories. Concerned about making their voices heard by a national audience and participating in the construction of historical memory, members of these organizations expressed their interest in experimenting with the use of new media technologies and the Internet for storytelling purposes. The initiative responds to the interest of community members in reaching a wider audience and circulating their stories broadly. We provide training and technical support for the development of digital languages, and facilitate workshops in digital storytelling that are adaptable to the needs and resources of local organizations and communities. In total, 16 projects have been created across Colombia with support from Alfabetizaciones Digitales since 2013. The projects are led by members of grassroots organizations doing memory and community work like the Salón del Nunca Más in Granada, the Asociación de Trabajadores Campesinos del Carare -ATCC- Vida y Paz in Carare, or Fundación Espacios de Convivencia y Desarrollo Social  (FUNDESCODES) in Buenaventura. Other times the projects are created through a collaboration between several grassroots organizations located in a particular region such as as Memorias del Rio Atrato  that includes eight community councils and one organization, Consejo Comunitario Mayor de la Asociación Campesina Integral del Atrato  (COCOMACIA), from Chocó and Antioquia. Furthermore, Alfabetizaciones Digitales has also fostered the building of a network of local digital media producers distributed through the different country regions. The youths and adults that participate in the workshops become part of a network of “virtual managers of memory” that shares knowledge and offers mutual support. These virtual managers are in charge of leading the various projects, coordinating the production of multimedia content, and maintaining the websites. Moreover, they have access to a collaborative virtual platform where they share tutorials, tips, and can discuss different issues related to their local projects and digital media production. The following is an example of one of the digital stories created by Afro-Colombian youths from FUNDESCODES in Buenaventura. A video called “Soy Capaz” (I am capable) that documents how more than 200 children and youths participated in the re-appropriation of a public park in their community, and shared positive messages (What I am capable of…) of hope and peace. As virtual managers produce and publish stories online, they articulate identities, raise voices, and make visible their territories and populations. Such communication process allows marginalized communities and victims of war to narrate the world in their own terms, to document the cultural practices they do, and to actively participate in the construction of historical memory in Colombia. The multimedia content produced and published online by the virtual managers reveals the potential of using digital tools and networks for making memory in Colombia. 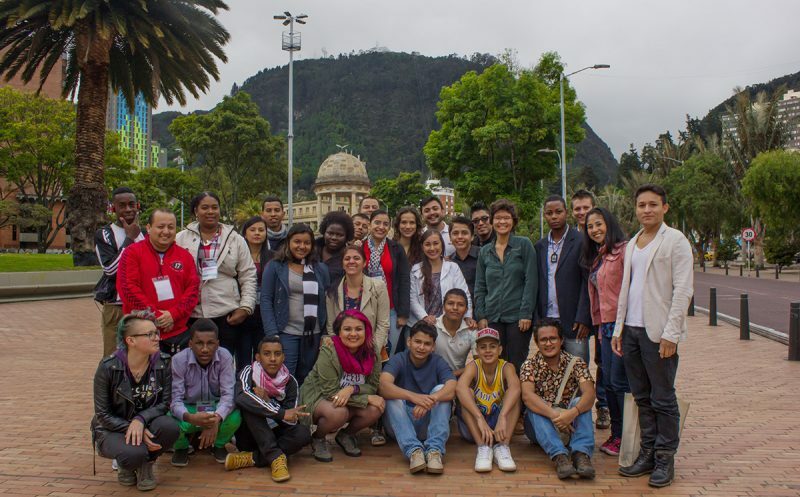 The Alfabetizaciones Digitales  initiative is an opportunity to connect with the voices and perspectives of Colombian citizens who — while trapped in the middle of a war between armies — have resisted violence and become resilient. Their stories show us a glimpse of their everyday lives, their neighborhoods, their dramas, and celebrations. Their narratives help to create a more plural consciousness of the past in Colombia, and contribute to building peace in the present and the future.